Looking for the best cat flea shampoos? Below, I will go through the top 5 cat flea shampoos to help you determine which one is right for your pet. How much does cat flea shampoo cost? What should you be looking for when buying cat flea shampoo? Flea shampoo and kittens, what do you need to know? When you look for the right flea shampoo, the first thing you might notice is the price. Cat flea shampoos that are designed to be used at home have an average cost between $10-$12 for a multi-use bottle. Smaller bottles can be around $6, while the more expensive brands and large bottles can be anywhere from $20-$25. Most cat flea shampoo bottles can be used more than once and should last for at least a month or two before purchasing more. Cat flea shampoos across brands contain many of the same ingredients such as pyrethrins. When searching for a shampoo, one that contains pyrethrins is a good choice because they are natural extracts from plants which work as insecticides. Pyrethrins degrade quickly and are unlikely to poison a cat if they are accidentally ingested, but you should still be careful. If your cat is petite or younger than two years old, you should look for a flea shampoo which uses more natural ingredients, such as rosemary, to kill and repel fleas. Pyrethroids are similar to pyrethrins but are inorganic, synthesized compounds, which last longer than pyrethrins and are harder to break down. Do not use a cat flea shampoo which contains pyrethroids because they are unsafe for cats and kittens alike and have a high toxicity. Another important characteristic of a flea shampoo is whether or not the product is effective of flea eggs and larvae. Some products will only kill and repel adult fleas but will leave the eggs behind, requiring more washes. If possible, choose a shampoo that can kill fleas at all stages of life and repel them for at least a week after a bath. Otherwise, you might end up bathing your cat too often and drying out their skin. Finding a shampoo which includes natural conditioners can be useful to help cats achieve smooth coats and maintain soft, healthy skin after a bath. We recommend first using a product like Capstar to knockdown all fleas on your cat and then apply a shampoo to ensure all the dead fleas and remaining eggs are properly remove. When bathed, thoroughly clean the infested areas of your home and monitor to see the results. Does cost vs quality matter when it comes to cat flea shampoos? Something else to consider when buying a shampoo is cost vs. quality. Many flea shampoos won't kill all of the pests or eggs in a single wash, and you might need to bathe your cat two or three times for full efficiency. Cat flea shampoos which eliminate fleas in a single wash tend to also be long lasting, but are more expensive. It’s important to find a shampoo which fits your budget, but pay attention to how effective the product is. A bottle might be cheaper, but if you need to use it more often, it won’t last long and you will need to buy more. Before using any product, read the instructions carefully. Some shampoos can be used as they come, but others will require that you make a homemade solution where you dilute the soap with water before application. Cat flea shampoos can be used during a regular bath and do not require gloves. Using warm water, gently rinse your cat until they are thoroughly wet. Place the shampoo on your hands and then lather your cat while avoiding sensitive regions like the head and around the eyes. Most flea shampoos need to be left on the cat for at least five minutes for maximum effectiveness, but products vary. Rinse your cat using warm water again and use a brush or your fingers to remove dead fleas. Many cat flea shampoos can be used on kittens, but you should always check the warning label before bathing any animal. Kittens who are twelve weeks old or younger should never be bathed with a flea shampoo because it can cause severe skin irritation and even death. Many of the chemicals in cat flea shampoo, especially pyrethrins and pyrethroids, will poison kittens. Pyrethrins and pyrethroids are not toxic to mammals in small doses, but kittens are too little to come into contact with the amount present in most flea shampoos. If they do have a flea problem, bathe them gently in warm water and remove the fleas by hand without any additional soap or bath products. One of the most popular brands in the industry manufactures this shampoo, which is effective at killing fleas, ticks, and lice. The shampoo also eliminates flea eggs and can prevent any remaining ones from hatching for 30 days. It is simple to use but requires keeping your cat lathered for at least five minutes, which might be difficult if your pet hates baths (especially cats). The shampoo has some repelling power and can prevent future pest problems for about a week after the first wash.
A regular bottle of this cat flea shampoo should last for at least 7-8 washes on a regular-sized cat, making it one of my favorite investments for a pet because it is inexpensive and can last for months. This shampoo is a vivid green, which means it is easy to see when rinsing a cat. The formula also does not cling to a pet’s skin or leave an oily residue, so pets can feel cleansed and refreshed after a bath. 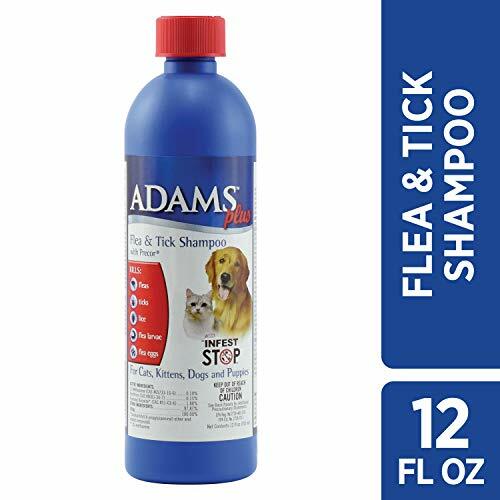 Adams Flea and Tick Shampoo can be used on kittens over twelve weeks old and continues to be effective as they age. Triple Action Flea and Tick Shampoo is designed to soothe skin irritation while eliminating fleas, which makes it a viable choice for pet owners with sensitive cats. The shampoo can be used on kittens over 12 weeks old and continues to be effective as they grow. The product uses pyrethrins, which kill and repel fleas without the additional toxicity of pyrethroids. Sentry PurrScriptions is an inexpensive but effective product which leaves a baby powder smell on cats. The product contains pyriproxyfen, which helps repel fleas for up to 30 days after the initial wash. The product’s ingredients can also prevent any remaining fleas from reproducing and destroys flea eggs or larvae on your cat. 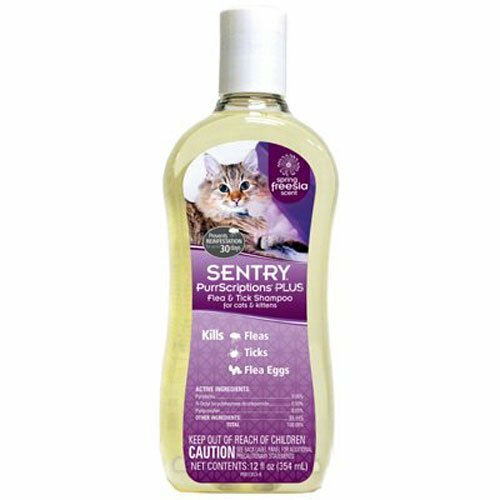 Sentry PurrScriptions can be used on kittens over 12 weeks of age and does not have as long of a lather and soak time as other shampoos, although cats with serious flea problems might need more than one bath. Pet owners with long haired cats might appreciate the amount of conditioners this shampoo includes, which leaves cat hair silky smooth and easy to brush after a wash. I recommend this option to pet owners who want a pleasant smelling alternative to other flea shampoos and who would like the repelling power of natural pyrethrins. The product kills fleas, ticks, and lice at all stages of development and can repel them for weeks after the first treatment. The shampoo possesses a pleasant odor without any lingering medicinal smell. Cats might require more than one wash with this shampoo to remove all fleas. Most cats will need to be brushed after use to prevent tangles. Pet owners might object to the use of pyriproxyfen because it is a stronger chemical when compared to ingredients found in other products. 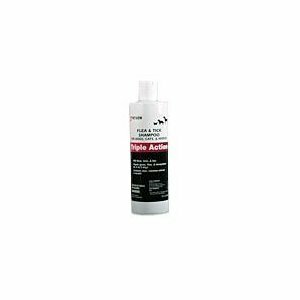 I frequently recommend this product because Triple Action is a leader in the industry and creates strong yet gentle cleansers that work on a variety of pets, including cats and kittens. Although this shampoo is more vigorous than many others, it is designed to soothe skin irritation and help treat the inflammation and tenderness caused by flea bites or dry skin. This shampoo also uses natural pyrethrins, which is a feature that kills and repels fleas for a short time after application. This product works as a combination of power and mildness because it can eliminate tough fleas and their eggs while treating a cat’s skin and calming sore bites. I appreciate this feature because my cat has sensitive skin and doesn’t scratch as often when I use this shampoo compared to other brands. The product can be used as is or can be diluted with two parts of additional water to create a milder, gentler formula for animals with extremely sensitive skin. The shampoo is more expensive than other brands at $20-$22 a bottle. This product kills fleas and ticks using natural pyrethrins that can repel pests for an additional two weeks after use. It should be lathered into a cat’s hair for its full effect and comes ready to use from the bottle with no added chemicals and no need to dilute the original formula. The shampoo is designed to be gentle on the skin and to leave a clean scent which can be refreshed by running a moist cloth over the cat for at least a week after the initial use. People whose cats have sensitive skin might enjoy this product because the formula is designed to be mild and soothing. I mainly recommend this product to individuals who are looking for a relatively inexpensive but still effective way to eliminate and repel fleas. The product uses natural pyrethrins to kill and repel fleas, which might appeal to people who want to use as few chemicals as possible. The shampoo can be used on kittens over 12 weeks old and will work when they grow up as well. Many fleas die on contact from the strength of the shampoo and can be rinsed off of the cat with ease. The scent can be unusual or harsh to people with a more sensitive sense of smell. It might take several washes to eliminate all fleas and flea eggs because of the weakness of the ingredients. All cats are different and will react differently to various flea shampoos, which makes it difficult to recommend one in particular. If you own a kitten, remember to check their age and choose a product which is safe for their use. There will ultimately be a fair amount of experimentation to find the right cat flea shampoo, but the five products listed above are some of the top picks in the industry. People need to find a balance between cost, quality, and how quickly they want to eliminate fleas from their cat. The cheapest option might not be the best for your cat's skin and can cause additional side effects like irritation, while a more expensive option might be too harsh or unfeasible to purchase for a single flea problem.